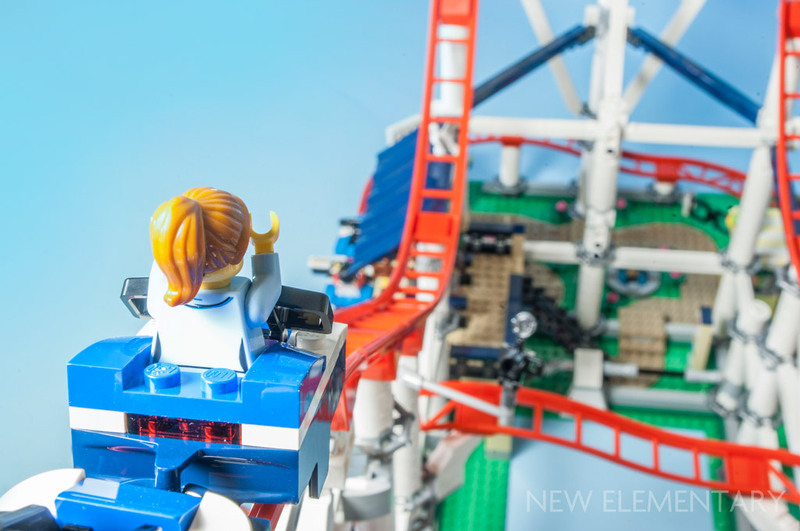 The fairground sub-theme of LEGO® Creator continues in 2018 with the thrilling 10261 Roller Coaster. Sven Franic has braved the ride to bring you info on all the new parts in this 4080-piece set, priced £299.99 / US$379.99 / 329.99€ and on general sale from 1 June 2018. When the new roller coaster tracks were first introduced last autumn, I think we all knew TLG hadn’t made six new elements purely for the Joker Manor. It was just a matter of time before we saw the first ever official roller coaster set. Even with specialized track and car elements, the 10261 Roller Coaster is a feat of mathematical LEGO engineering. All that geometry serving both structural and aesthetic functions had to be legal, which looks simpler than it actually is. In terms of overall dimensions, I think this is the largest LEGO set ever. Besides, it is a sort of milestone in the LEGO System. If I were to design a large metal scaffolding construction, such as a roller coaster, my first instinct would be to grab the bin with LEGO Technic beams. They are easy to connect at odd angles and have several times more connecting power than any System brick. Since this is a Creator Expert set, it is safe to assume that having most of the construction built in Technic wouldn’t fit the theme, despite the Technic design team’s efforts to convert Creator Expert designer Mike Psiaki to their “superior” building system (as our friends at Zusammengebaut discovered). 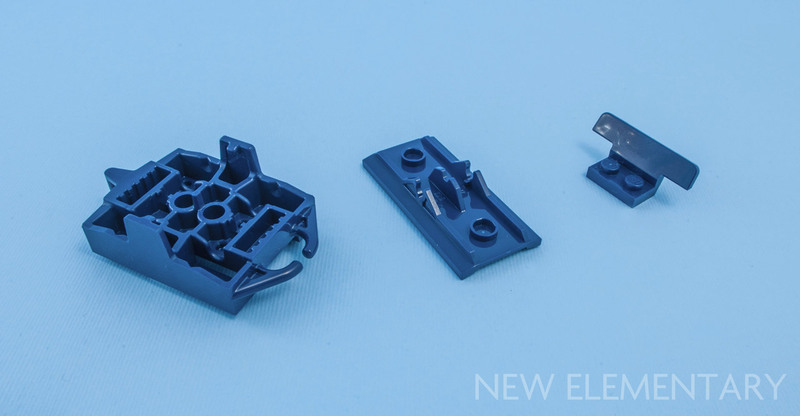 It is hard to believe the Technic department wasn’t involved, at least as advisors, but as far as the construction holding the rails goes, it is built in Creator-friendly System brick. However, there is more to the white pillars than meets the eye. A fortunate functionality of the centre axle hole in the 2x2 Round brick must be its most efficient use in this piece’s 40-year existence. A whopping 530 of them are used in the set as vertical beams for the rails which would likely collapse without the indispensable help of Technic axles securing them through the core. The only part where Technic beams are used is to bridge between short segments of the pillars where modified plates without the functionality of axle holes had to be sandwiched in. Securing all these pillars to the ground requires an equally ingenious method. 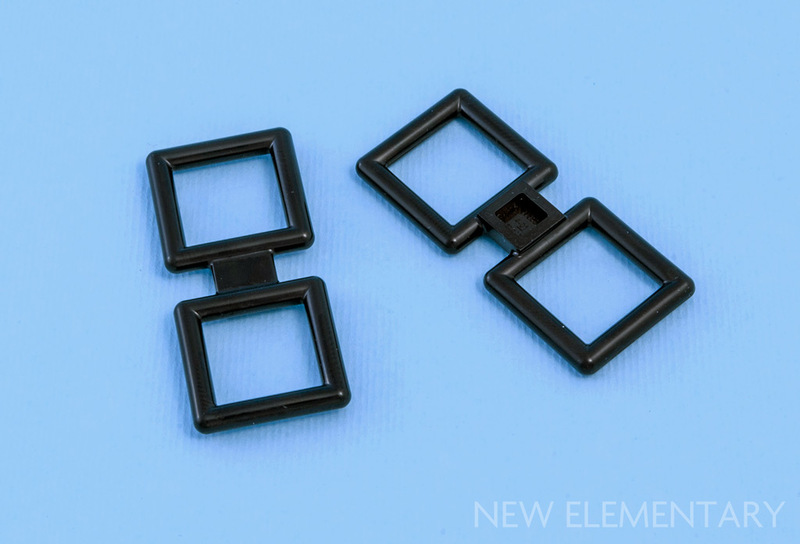 A frame surrounds the foundation holding down the pillars with clips, making the “parabolic ring” (Element ID 6020990 | Design ID 75937) with its octagonal bar connections one of the most copious elements in the set. The elaborate train of mechanisms which powers the roller coaster winch deserves special mention. The use of the Technic rubber connector (Design ID 45590) as a tension spring to get a satisfying rocker-switch feel when pushing the lever is a stroke of genius and a kind of subtle detail that adds shine to the overall play experience. Exploiting the ornamental design of the “Ninjago fence” (32932) to support the lever shouldn’t go unnoticed either. Another unexpected and clever solution is the ratcheting freewheel mechanism for one of the cranks. In layman’s terms, it is a system that allows a gear to rotate or apply torque in only one direction, like the rear gear on a bicycle. I find it unnecessary for the function in this set, but its pure simplicity is enchanting nonetheless. To get the conspicuous rail elements out of the way: there are now seven individual segments of rail elements available and, so far, the complete range is only available in Bright Red [TLG] / Red [BL]. Neither of the other two colours (Medium Lilac [TLG] / Dark Purple [BL] and Medium Stone Grey [TLG] / Light Bluish Gray [BL]) can complete the full length of track in this set, with the short steep segment of rail (Design ID 62561) exclusive to this set. At first glance, the new Brick Modified 1 x 2 x 1 No Studs, Curved Top (6227184|37352) looks like the Brick Modified 1 x 4 x 1 1/3 No Studs, Curved Top (Design ID 10314) cut in half, but the new element is also shorter by one plate. It is a useful substitute for the cult “R-slope” element (6091) (a nickname passionately advocated by AFOL Simon Liu) when the distance between them has to be less than two studs. This comes at the price of having a single connection point which affects the structural integrity of the builds. 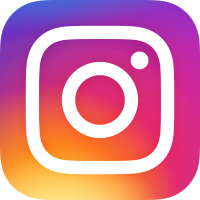 Even though I would rather have a 1x1 version of this, every new piece in the curved slope category is welcome. Although Chris McVeigh has already introduced New Elementary readers to the Brickheadz glasses, I will still sneakily categorize this piece as new. 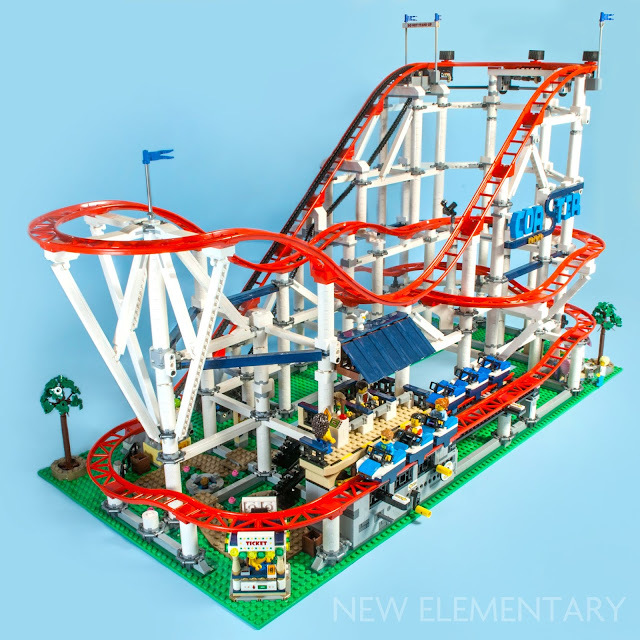 The Roller Coaster comes with just the rectangular version, Bar 2.25 x 5.25 Double Squares (Element ID 6208551|Design ID 35366) which is suitably used as a fence. For a minute I was worried that this was a Brickheadz exclusive piece, even if I couldn’t yet find any revolutionary function for it apart from adding character to the brick interpretation of yourself. 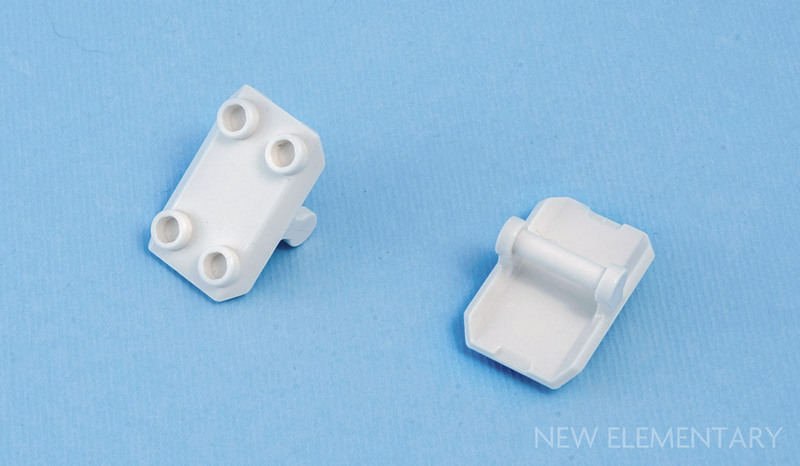 A piece that was introduced in 2017 in the 75192 UCS Millennium Falcon has passed slightly under the radar. It’s not until it made an appearance here as a functional part that it caught my attention. This is perhaps because BrickLink calls it a minifigure shield (6188400|30166) which is an easy category to overlook. The piece is used as a bar connection support directly under a plate which, despite its rather large dimensions, is the type of piece I can see myself reaching for whenever strange geometry is required. 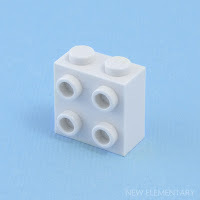 The set comes with an exciting recolour in White of the Brick, Modified 1 x 2 x 1 2/3 with Studs on 1 Side (6218823|22885) but, as if to tease us on purpose, there is only a single piece in the set. 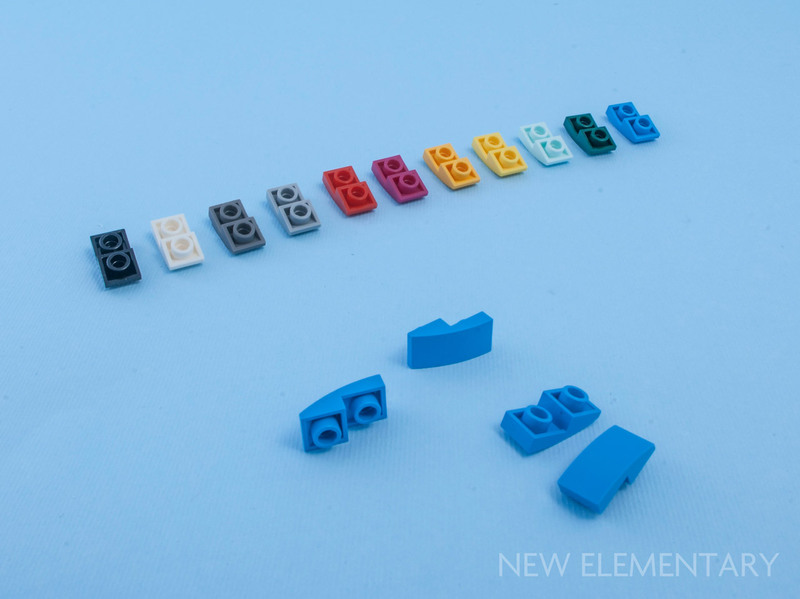 If it is any consolation, it is used for a function in the set that is not essential in this colour which almost certainly means it is coming soon in other sets. Another new White piece is the 2x2 Round Brick with pin holes (6218899|17485) if that should be of any use to you. 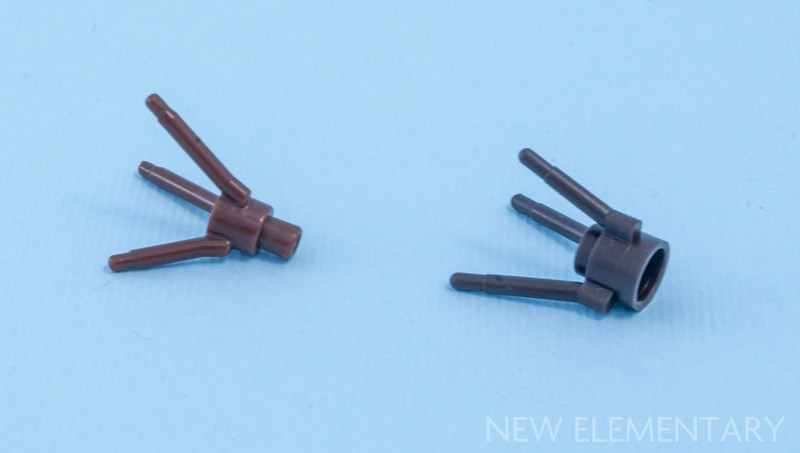 Just as the old flower stem element (Design ID 3741) seems to be going out of production after 40 years and becoming available in Dark Brown in its last days of existence in 70620 Ninjago City, the updated mould which exchanges the anti-stud for a bar on the bottom is now available in the next best thing: Reddish Brown. Some of these plant elements are made of a softer plastic which is known for weaker clutch power. A bar makes a stronger connection than an anti-stud. An added incentive for changing some of the plant moulds might also have something to do with the new sustainable plant-based plastics which are planned to be used first on those softer plant elements. It is funny how some LEGO elements are stuck with the name for what they were first used. 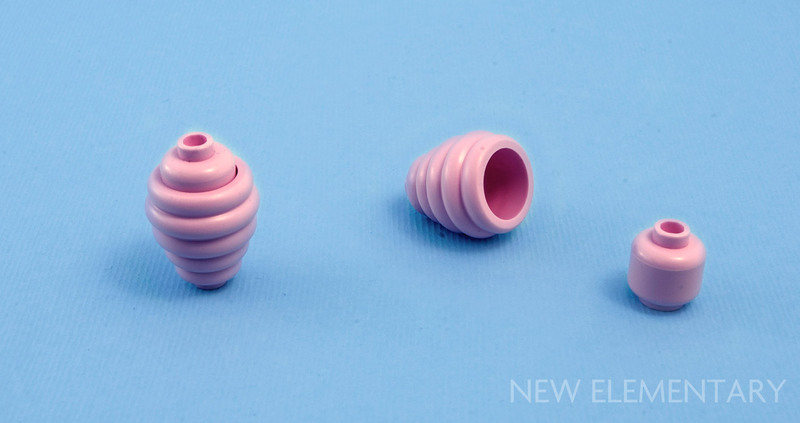 What BrickLink calls a beehive, and TLG’s bizarre naming habits designated a “Mini Hat”, is now available in Light Purple [TLG]/ Bright Pink [BL] (Element ID 6229124 | Design ID 35574). This set cleverly recycles the piece as fairy floss, more commonly known as cotton candy. It is a four-piece build and after you insert a minifigure head – which is also new to Light Purple (6229124|3626) – the “Mini Hat” name suddenly makes more sense. 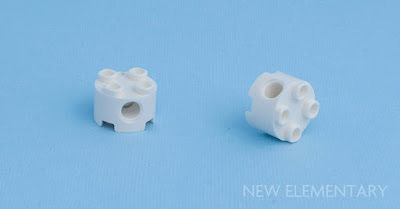 It is likely a technical function of the beehive piece to accept a minifigure head element rather than to function as a possible fashion accessory in future sets. Dark Azure is a colour that has matured very quickly in recent years. Starting its life in 2011 in the Alien Conquest theme, it spread throughout all LEGO themes and has become a widely accepted member of the palette. 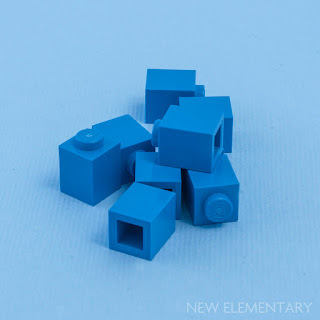 Sometimes it just so happens that a certain colour has gaps in the very essential elements available, and for Dark Azure this was the ubiquitous 1x1 brick. Thanks to the “Coaster” lettering in this set, we can now close this frustrating gap (6225538|3005). Another happy addition to the Dark Azure lineup is the “inverted baby bow”, Slope, Curved 2 x 1 Inverted (6231942|24201). Here’s hope that the inverted versions get as many recolours as their non-inverted counterpart. Earth Blue [TLG] / Dark Blue [BL] is used as an accent colour in the fairground sub-theme of Creator Expert, so some recolours in this department are no surprise. The Coaster cars (6233695|26021), Hinge Panel 6x3 (6229129|2440), Vehicle Spoiler 1 x 4 on 1 x 2 Base (6187275|30925) and 2x2 Curved Tile (6199898|27925) are all given the Earth Blue treatment. The 2x2 Curved Tile is the only new 'non-niche' part in Earth Blue (6199898|27925) and is now the second colour, with Medium Stone Grey, that have both 2x2 and 4x4 versions available in the same tone. 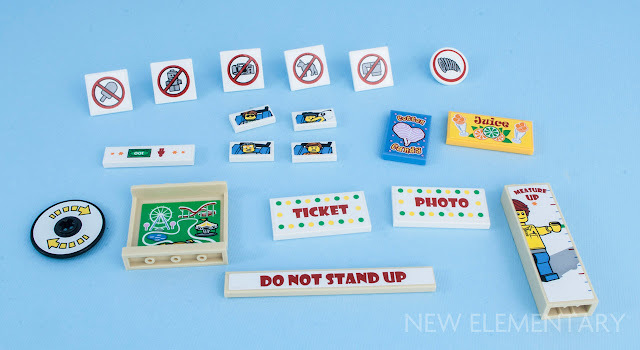 The set uses no new printed pieces. Most of the stickers are set-specific. The juice bar and cotton candy tiles might come useful some day. With the resources needed to develop a brand-new track and car system for the Roller Coaster, TLG must have pinned a lot of hope in it. 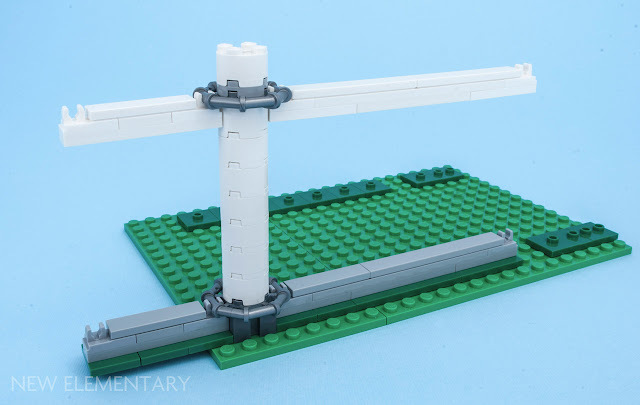 The LEGO City Miners sub-theme came at an appropriate time, making use of the rails, and I am eager to see what other new ideas they come up with to exploit the elements. The old narrow rail system introduced by the Indiana Jones theme is still used in the Friends 41130 Amusement Park Roller Coaster. But with its limited range of only two individual track elements per colour, it doesn’t seem to be going far in terms either of further development or ride excitement. 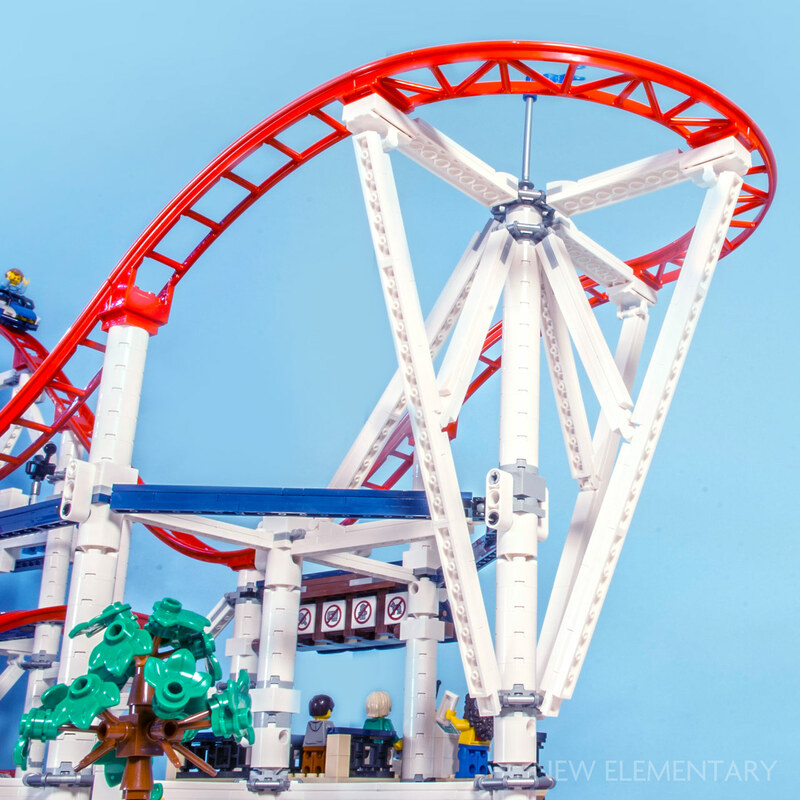 It is a good time to be a LEGO fan with three iconic fairground rides available at the same time. I can’t wait to see the humongous reinterpretations of these rides in upcoming AFOL conventions. Suspended railway, anyone? Or even better: help our fundraiser! If you enjoy what we do and can spare the cash, how about giving us what you feel we are worth? The price of an app, a book, maybe an annual magazine subscription? It would really help us bring you even more great articles. The reason BrickLink calls part 6188400/30166 a minifigure shield is because it was first introduced as a sci-fi looking riot shield in 75166 First Order Transport Speeder Battle Pack (where it's printed with a little viewport/window) earlier in 2017. I think the unprinted version was first used as a structural element in the UCS Millennium Falcon. There's also 4 of them in dark red in 76105 The Hulkbuster: Ultron Edition. The dark red ones also appear in some of the upcoming Ninjago sets. Myself, I'd love to see them come in black. I've been working on custom Ninjago City expansions in my spare time, and these would make for excellent roofing elements. This set is on my list to get! I just finished watching the Netflix LEGO episode of the The Toys That Made Us where they talked about staying in the "system". I liked the youtube video you linked to where they talked about "Just build it with Technic" and the designer talking about wanting to keep as much "system" as possible. I hope we see this railing used in other sets as well. 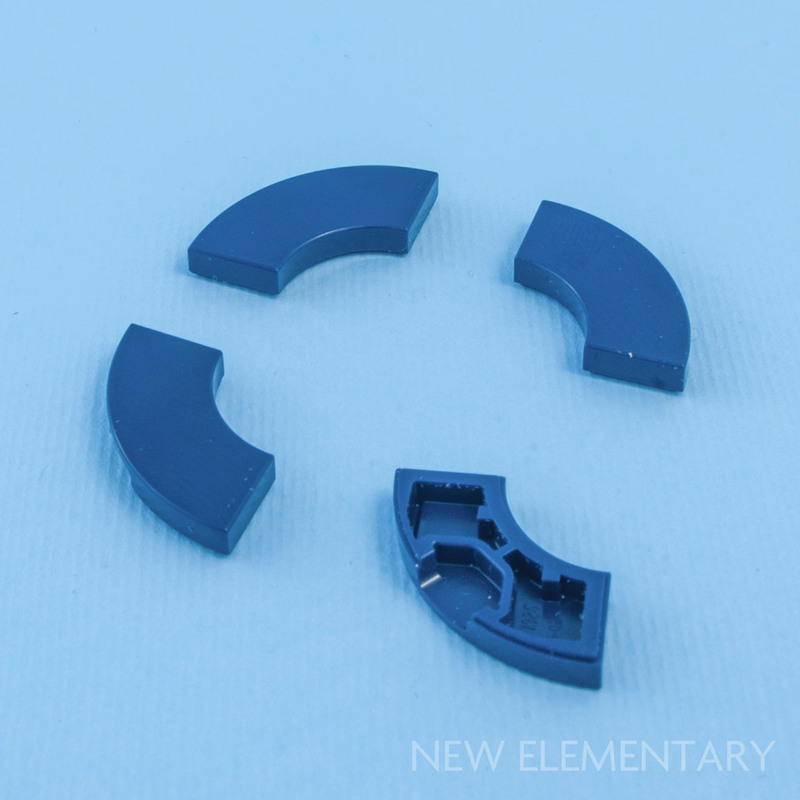 Lots of new, useful parts! However, I think Earth Blue/Dark Blue is actually the fourth color with both curved tiles. In addition to Medium Stone Gray, these parts appeared in Dark Turquoise in 10260 Downtown Diner and in Medium Lilac/Dark Purple in two Friends sets - 2x2 (27925) in 41332 Emma's Art Stand and 4x4 (27507) in 41336 Emma's Art Café. If 6091 is the "R-slope", does that make 6081 the "Arrrr-slope"? Regarding the plant-based plastic, it's polyethylene. It's made from ethyl alcohol, which is a specific molecule. Once you figure out your source for ethyl alcohol, the rest of the process is identical, and barring any trace impurities in the result there should be zero difference between parts sourced from plants and parts sourced from La Brea. The beehive piece was intentionally made to fit over a minifig head, and if you look at the back of the box for #60175 Mountain River Heist, the image in the upper right corner shows one of the convicts with the beehive completely covering his head. Oddly, the same beehive appears in two other Mountain Police sets, but neither of those have any exterior images showing off this aspect of the element design. I don't own any of them, so I have no idea if they demonstrate this inside the instruction book, but I suspect they would. Both the shallow and steep slope elements (but not the short steep section) appear in light grey in the new Pirates Roller Coaster. Fan Media Days are approaching!